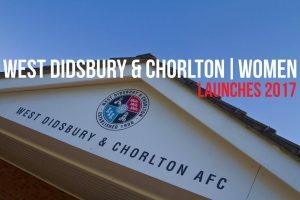 West Didsbury & Chorlton announced their intention to form a women’s team in December of 2016 with the appointment of Chorltonian Ladies Manager Paul Caddick with the intention of beginning play in 2017. Following Chorltonian’s decision not to continue with women’s football an agreement was made to transfer the team across with the majority of the squad making the transition to play in the NWWRFL Division One South. The new team was aided by the support of world famous independent record Piccadilly Records and a group of West supporters known collectively as ‘Chorlton Reds’ who became the home and away shirt sponsors respectively. West Women’s first ever competitive game took place on Sunday 3rd September in the SSE Women’s FA Cup with Warrington Wolverines the teams first ever opponents. Striker Elizabeth Livesey entered the record books as the first ever official goalscorer as the team registered a 3-2 win thanks to a late Livesey winner. The FA Cup run shape West’s opening months as they defeated NWWRFL Premier Division side Blackpool on penalties in their next game two weeks later before dispatching MSB Woolton 6-3 in the 3rd qualifying round. 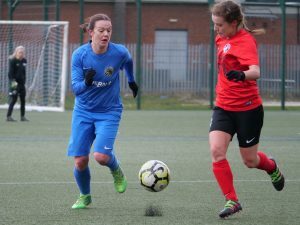 Their run came to an end in November in thrilling ‘Classic West’ fashion as they came from behind four times away to Fasrley Celtic with Amy Friel scoring with the last kick of normal time. However they were undone in extra time eventually bowing out in the First Round Proper 6-4. In addition there was also a strong run to the Manchester FA County Cup Semi-Final where they beat Flixton 10-1 and Urmston Meadowside 6-0 before bowing out to the eventual winners. League life began in earnest fashion for West as they defeated City of Liverpool 4-0 in their first ever NWWRFL game before going onto win their first five league games. FA and County cup runs as well as unseasonably poor weather meant that West had only played 6 league games heading into February however an incredible run of 9 straight wins lifted West to second, the position they would not relinquish, in a strong field including Curzon Ashton, Warrington Wolverines, Altrincham and Liverpool Marshall Feds Reserves. The highlight of the run included a 5-4 win away to Curzon with West having been 3-0 down after half an hour before scoring five times in quick succession to wrestle the match away from the home side. A successful first season, one that exceeded the management teams even wildest expectations, was destined to be built on as the club announced its intention to field a development team in the Greater Manchester Women’s Football League for 2018/19 with plans for both Under-18s (in conjunction with The Manchester College) and Under-16s in 2019/20 as part of the clubs overall ambition to be represented in girls football at every age group. 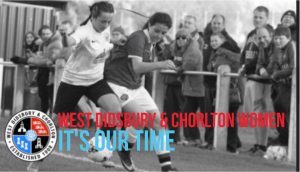 West Didsbury & Chorlton are a club committed to inclusion and everyone is welcome. The club is supported by volunteers who give up their time generously to ensure its continued growth and success. The women’s team are lucky to count Jim Burke, Alex MacLean and Mike Curry among its volunteers but we’re are always on the look out for more people to get involved.